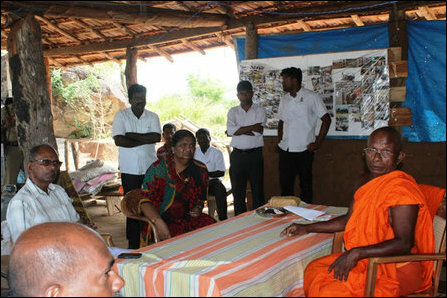 After seizing around 16,000 acres of lands, which were officially allocated as grazing lands for the cattle in the Batticaloa district, more than 300 families of Sinhala colonisers from Polonnaruwa, Badulla and Moneragala districts have started to construct a Buddhist temple under the leadership of a former Sinhala policeman at Mayilaththamadu, which comes under Koa'ra'laip-pattu South (Kiraan) division of Batticaloa district. The area was under LTTE administration during the times of war and peace until 2007. The occupying ‘Sri Lanka’ Army is having a artillery base near the new Buddhist temple, which has been put up after January 2016. 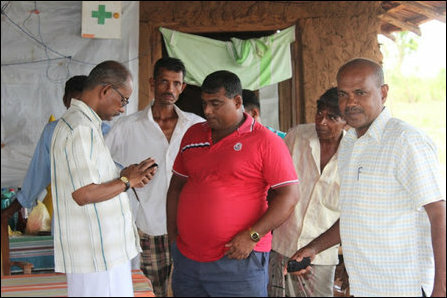 The SL Government Agent of Batticaloa and Eastern Provincial Agriculture Minister inspected the illegal occupation as 259 Tamil dairy farmers started to boycott their daily supply of 3,000 litres milk to Milco from May 1st demanding immediate action. The farmers say their dairy villages and livelihood were being destroyed by the occupying Sinhalese, who also gun down their livestock. During the times of the LTTE, the farmers were being protected and they were able to sustain their livelihood. The Tamil farmers have also said they would start fast-unto-death protest if the district authorities fail to address the structural genocide against them. After repeated complaints from the Tamil farmers, the Minister of Agriculture from the Eastern Province, Mr K. Thurairajasingham and the SL Government Agent Ms. P.S.M. Charles, visited the site where a Buddhist temple is being constructed by a Sinahala extremist monk. The divisional secretaries of Ea'raavoor-pattu (Chengkaladi) and Koa'ra'laip-pattu South (Kiraan) also accompanied the EPC minister and the SL GA. The Buddhist monk has been brought in by the occupying SL military and the Sinhala colonisers, Tamil farmers say. An armed paramilitary, known as ‘homeguards’ is also operating against the Tamils, Tamil farmers say. The monk has now started to claim that the Sinhalese were living in the area in 1967 and that they have all the rights to establish colonies and construct Buddhist temple. The Minister of Agriculture from the EPC said the claim by the monk was totally false. The Sinhalese are now trying to annex the area with Polonnaruwa and change the demography of Batticaloa district, he said. Ven. Ampitiya Sumanaratne Thero, the chief monk from Sri Mangalaramaya Buddhist Vihara situated in the city of Batticaloa has been actively promoting the establishment of the Buddhist temple at the occupied locality. The Sinhala settlers have a “village leader” or “Sabapathy”, named Linyanage, who is heading the occupation. He is a former SL policeman and is actively liaising with the SL military, which is having an artillery base 100 meters close to the newly established Buddhist temple.